Bookworms at Marist College have a powerful ally in Sarah Gould. They call her the book whisperer. She’s got a personal collection of 10,000 titles, and counting. There’s not a volume she can’t find. “Generally if a student asks me if I have a book and I don’t I’ll say ‘do you really want it? Give me a week’. Then I’ll go and find it and I’ll buy it as cheaply as I can. I have my finger on every web page you can buy books from,” she says. Sarah’s collection is so physically large it’s kept in a storage container. But 1500 choice titles are here on the Marist shelves. It was the perfect solution for the new school without a library. 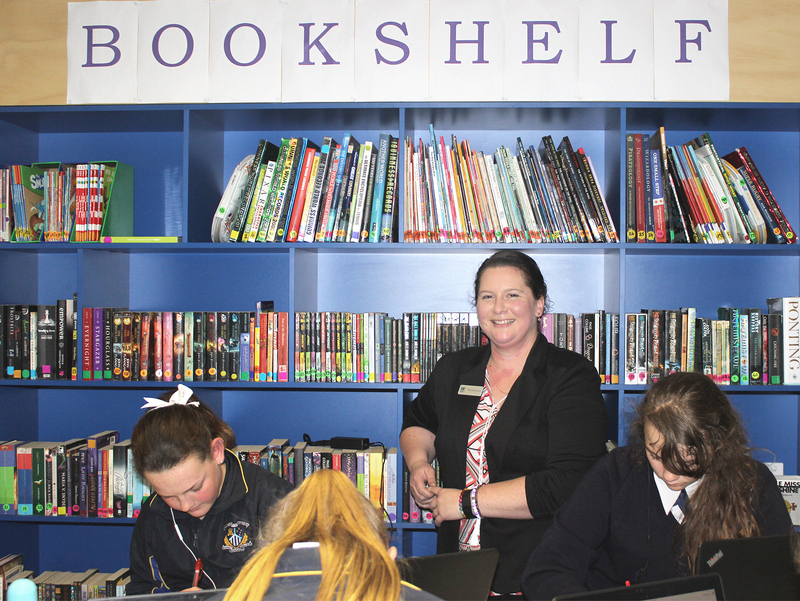 Sarah says eventually, the Marist buildings will be “stitched together with books” as shelves fill up within the open-plan spaces. It was while Sarah was working at a Rochester primary school that she really saw the power of reading in children’s lives. “The kids loved reading but we only had a very small library,” she says. “I watched them in first semester and I knew we really needed more books for these kids. So in second semester I lugged up three car loads of tubs filled with books, and I lined them up on the long bench in the room. Sarah graduated from the Bendigo campus with a Bachelor of Education, with majors in Indonesian and children’s literature, and a minor in music, in 2006. She spent the first few years of her teaching life working as a CRT and short-term contract music and Indonesian teacher. She says she had her heart set on teaching full time at a catholic school in Bendigo, and it was hard to crack. Sarah said it was a year of ticking off her bucket list of must-reads, including gothic, American and women’s literature. With the extra qualification under her belt, Sarah soon landed that full time job at Holy Rosary in Heathcote, where she taught for three years. And then the Marist roles were advertised. For Sarah, joining the new team here was like winning lotto.